Volunteers are the lifeblood of Vintage Trains; without a dedicated team of volunteers from all walks of life, giving as much or as little of their time as they are able it would not be possible for Vintage Trains to continue to operate as the UK’s premier operator of main line express steam trains. 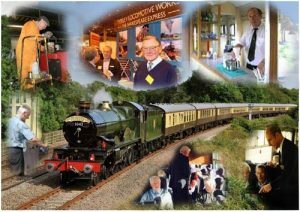 There are many volunteering opportunities, all of which offer a range of member benefits to those volunteers who are also a member of the Friends of Vintage Trains. Please visit the how to volunteer help page to contact us if you are interested in joining our volunteer team. Please note that all volunteers are welcome, and we will endeavour to match their aspirations with the opportunities available. However it must be understood that for the operational activities, individuals will need to undergo appropriate supervised training and assessment of suitability. There is a page showing volunteers working on a range of projects and enjoying some social activities. See the location details for Tyseley Locomotive Works for information on finding us.